This post’s TUNE comes from The Human League. Everybody knows “Don’t you want me baby...” mainly because it is a hell of a song, but my personal favourite is this little number. I think by now you might have started to realise that my musical taste is very eclectic, but I do have a bit of a thing for the eighties, despite some of the fashion disasters which came from this period, there were many a tune produced that has stood the test of time, well in my eyes I think it has! Listen to the video here and check out the website here. Ok, so this is what I'm slowly learning whilst doing this blog... Half of my wardrobe is Primark. Fact. Anywho, I love this little baby doll dress, it's so pretty, but so old, but given the material it has survived well! As it is just so cute I have kept the accessories to a minim other than my good old faithful watch (one must always wear a watch don't you know), and a pair of polka dot tights. 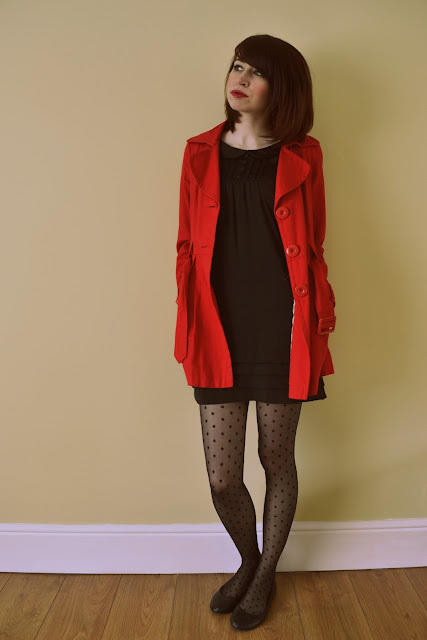 Ah polka dot, it seems to be doing the rounds at the moment and I am all for it, I love it and I especially love these tights! I normally wear a medium in tights (mainly for the height, I'm 5'8"), but with these I bought large as I think it's so easy to rip tights like these so it's best not to have to pull them too much... just a bit of a tip there. I have finished the outfit off with a splash of red using my old mack that I can't even remember buying it was that long ago... But I think looks quite fitting. So there you go, another outfit another day. p.s. Do you like my new glasses? I was sent them by Firmoo, you can check out my post on these bad boys here. Those tights and the jecket are so cute! Keep up the great work hun! Stop being so cute! No wait... don't. I love your retro/vintage style! so cute. I love Primark, the one near me isn't very big but I still manage to find some great pieces. I really love their jewellery. The dress is very cute, I really like the collar. Those tights are great ! hello! thanks for coming to my blog! i love yours! cheers!